Stevens Point Orthopedic's specialists and surgeons are experts at treating shoulder pain. The shoulder is a complex structure consisting of three bones, the joints between them, and the muscles that generate its strength and motion. Everything from scratching your back to lifting a book requires the use of your shoulder. The shoulder has the largest amount of motion of any joint in the body. Because of this, it is often subject to excessive strain leading to pain and tissue injury. Shoulder problems can be caused by overuse, traumatic injury, and/or changes that occur naturally in your body. Suffering from shoulder pain? Contact us to learn about treatment options. The shoulder consists of three bones: the shoulder blade (scapula), the collarbone (clavicle), and the upper arm bone (humerus). 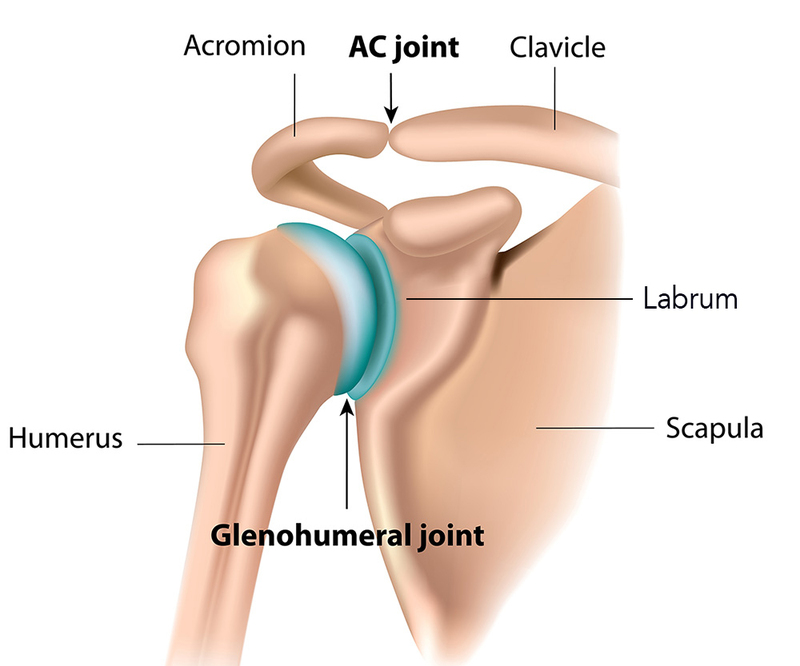 The shoulder blade and the collarbone come together on top of the shoulder to form the acromioclavicular (AC) joint. The upper arm bone is shaped like a ball to fit neatly into a shallow socket on the shoulder blade, referred to as the glenohumeral joint. The socket is shallow to allow a wide range of motion of the arm. Inside the socket is a flexible rim of soft tissue called the labrum, which helps increase the stability of the shoulder. Surrounding the shoulder joint is a group of four muscles that help to rotate the arm and provide additional stability. Together, these muscles form the rotator cuff. There are many other muscles that help move the shoulder, such as the pectoralis muscles (pecs) on the chest or the latissimus dorsi (lats) on the back. In order for the shoulder to function properly, the bones, joints and muscles must all work in unison. Evaluation for shoulder pain starts with you giving us a history of your problem: when and how it started, how it currently feels, and which treatments you have tried so far. We also ask you about other medical conditions that may contribute to your shoulder pain. We do a physical exam to test the structures of your shoulder. We check your shoulder’s range of motion and strength and do special tests that can uncover specific problems. Based on the findings of your physical exam, we may recommend a cortisone injection as both a clinical test and treatment for your pain. The numbing medicine mixed in the injection helps us determine the source of your pain, whereas the cortisone medication of the injection can provide pain relief. Sometimes we order tests such as x-rays or MRIs to visualize your bones and soft tissues. X-rays can show us things like fractures, spurs, and changes from arthritis. MRIs can show us more detail of the bones, as well as soft tissue damage like tears of the rotator cuff or labrum. In some cases, we need input from other specialists, particularly Neurologists – who can evaluate and test the nerve supply to the shoulder. Whatever the cause of your shoulder pain, we are dedicated to helping you find the best treatment. Request an appointment today. Treatment of shoulder pain is very specific to the diagnosis and severity of your symptoms. Lifestyle Modifications include: resting your shoulder, changing your daily activities to avoid painful situations, and doing exercises to strengthen weak muscles. Medications can help with some shoulder conditions. Non-steroidal medications (NSAIDs) such as ibuprofen or naproxen can relieve inflammation. If the inflammation is severe, then a short burst of a steroid medication may be an option. Medications like acetaminophen (Tylenol) can help to control your pain. Cortisone injections are used to target a specific location in your shoulder using a powerful anti-inflammatory medication. Numbing medications mixed in the injection help us know if the spot injected is the source of your pain. Physical therapy is a form of treatment that focuses on getting your shoulder muscles and joints to properly work together to move your arm. Even if you are very strong and active, you may have muscle imbalances which are causing you shoulder pain. Physical Therapists can identify and address these muscle imbalances through corrective exercises. They may give you a series of take-home exercises to help return you to regular activities pain-free. Surgery may be the next option for certain shoulder conditions if all other treatment options have been exhausted. Although many surgeries can be done through small incisions using a special camera to see inside the body (arthroscopy), some may still require a traditional open surgery.